Most years the first king caught from a N.C. fishing pier is decked at one of the Oak Island piers. However, for 2018, there is only one pier open at Oak Island instead of the two and three from previous years, so the odds had swung against it. Who cares about odds and percentages? Certainly not fish and when the kings decided to pay a visit to N.C. pier fishermen, they began again at Oak Island – and cobia joined them shortly after. Ocean Crest Pier (www.oceancrestpiernc.com) is the only pier open on Oak Island this year. Long Beach Pier was removed a decade ago and houses now stand on the lots where its pier house used to be. Oak Island Pier, formerly known as Yaupon Beach Pier, is closed due to a delay in getting it rebuilt, so if a king or cobia is caught from an Oak Island pier, it had to be from Ocean Crest Pier. That didn’t deter fishermen. They had faith their pier would produce and once again the first pier king was landed during April. Wayne Tyner was the lucky fisherman and landed a 35 pound, 7 ounce king on April 28. 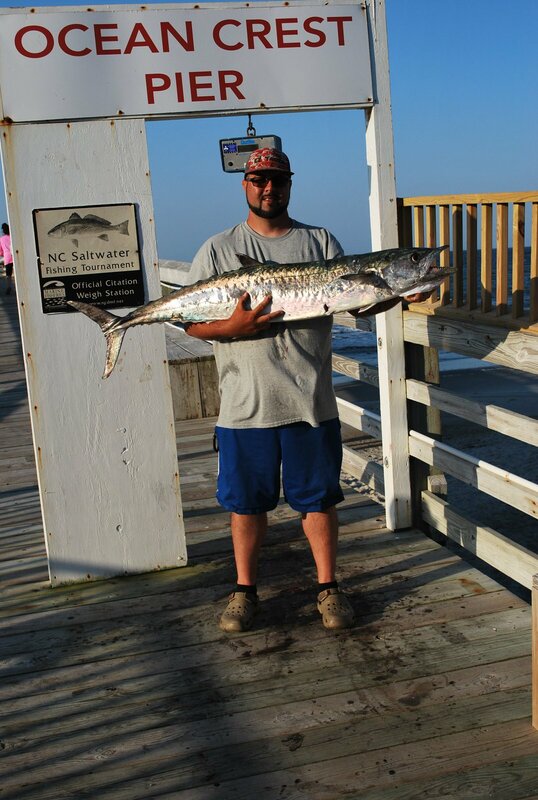 Not only was it a citation king (30 pounds minimum weight), but he collected a $100 bounty from Ocean Crest Pier. This was an early king, but others began to arrive about a week later. 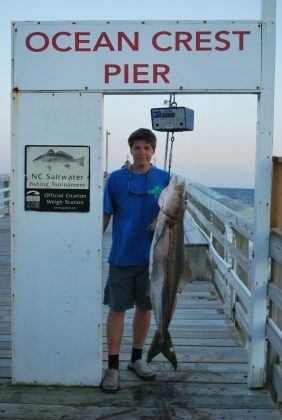 The action at the pier’s offshore end began to ramp up the next Saturday morning, May 5, and has been going since. 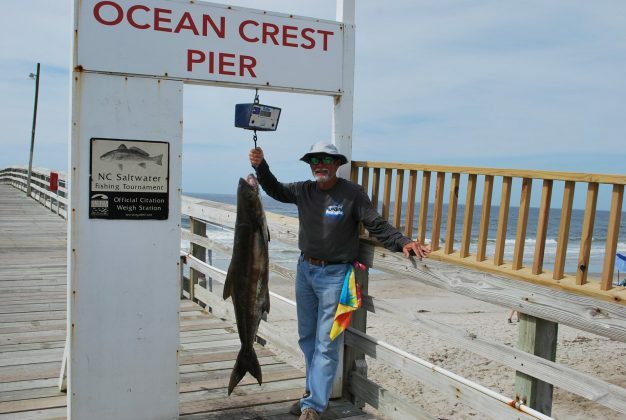 That Saturday there were 8 kings and 3 cobia landed from Ocean Crest Pier. Keith Rainer landed the first cobia that Saturday and collected a $100 bounty for it. It wasn’t a huge cobia at 22 pounds and 11 ounces, but he’ll remember it for a long time. 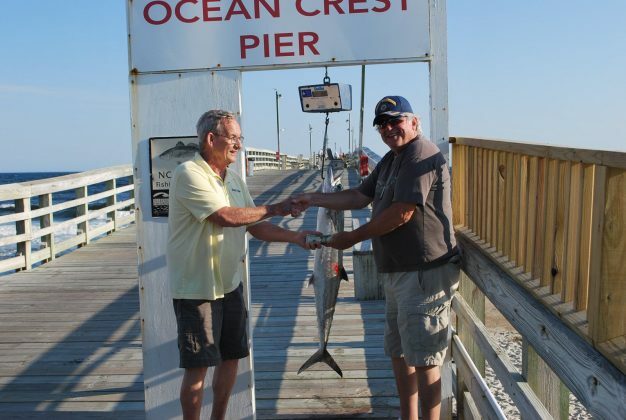 The action continued more steadily than rapidly, but by May 10, Dale Wilson had collected the pier’s $100 bounty for the 25th king of the year. At the time I was writing this, the king total had already reached the low 30s and may well be in the 40s by the time it is posted. 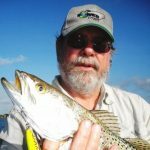 Not only are the kings biting, but many of them have exceeded 20 pounds, with a half dozen or more exceeding the 30 pound minimum for a citation. Tyner’s first king is the largest to date, but there have been several nipping at its tail. 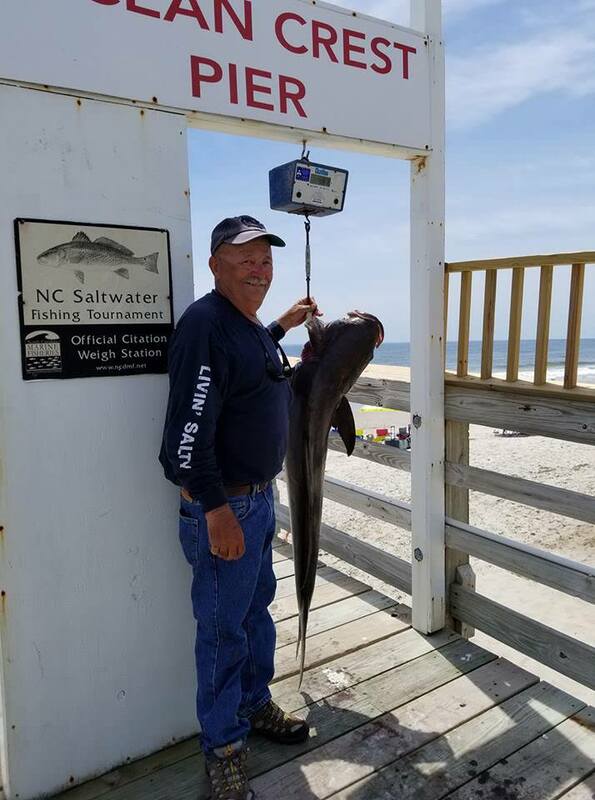 The cobia fishing isn’t quite as hot, but half of the cobia hauled to the pier’s planks have surpassed the 40 pound minimum for a citation. At this time, the largest cobia is the 51 pounder caught by David Ross on May 5. There had been king fishermen on the pier’s end for a week or so prior to Tyner’s catch, but it hadn’t been crowded. That changed the next day and since then the pier end has looked a lot like a dog’s nose after an encounter with a porcupine. Every slot has an anchor rod sticking up high and there haven’t been many open spots, even on windy and rainy days. Ocean Crest Pier manager, Steve Sanders, said it is a tradition at the pier to begin opening an hour earlier once the first king is caught. Sanders said he sent an e-mail and made a Facebook post on April 28 that the extended hours would begin the next day. Pier king fishermen use live baits and they must be tethered and closely watched to avoid tangles. Each fisherman begins with an anchor rod they cast with only a sinker to position and tether their bait. Anchor rods are long spinning and heaver conventional outfits that will cast long distances. There are numbered slots for anchor rods and they are spread around the Tee at the piers end. A second rod has the king rig, that holds a live bait. There are a variety of king outfits and rigs, but they have a few things in common. The reel must have a smooth drag and hold plenty of line. Pier king fishermen have to let the king run and then work it back in. Unlike boat fishermen, they can’t chase the fish. The rigs use treble hooks to hold the bait and catch the king. Some are as simple as a pair of hooks, while others use 3 and 4 hooks. This is personal preference. The prize live bait is bluefish from about 3/4 to 2 pounds. Menhaden and mullet are sometimes used, but bluefish are preferred. 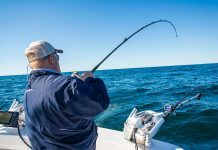 Once the bait is secured on the rig, it is lowered down the line of the anchor rod, with a release to let it go to be fought on the king rod. The action begins quickly when a king materializes from the depths and slashes at a bait. Sometimes they miss the first one and grab another and sometimes they find the hooks of the first one. At that point the anchor rod dips as the king pulls the rig free from its release and suddenly a reel is screaming. At this point the pier end turns into a sort of controlled pandemonium. As the fight winds down, the fisherman leads the king back to the pier and one or more of the other fishermen lower a gaff on a rope. Once in position, they snag the king (2 or 3 gaffs for large fish) and hoist it over the railing and onto the pier deck. Now is the time for big smiles, high fives and pictures. In a few minutes the lucky angler carries his fish down the pier to be weighed and recorded. The Oak Island piers are regionally known for being the first N.C. piers to produce kings most years. There was speculation another N.C. pier might score first this year with only Ocean Crest Pier open, but it held enough mojo for the whole island. Even better, many of the kings in these early runs are large fish. Most fishermen think of the fall as the prime time for catching kings from piers, but the king mackerel records for Ocean Crest Pier, the closed Oak Island Pier and the former Long Beach Pier, were all caught during the spring run and all are 50 pound class kings. 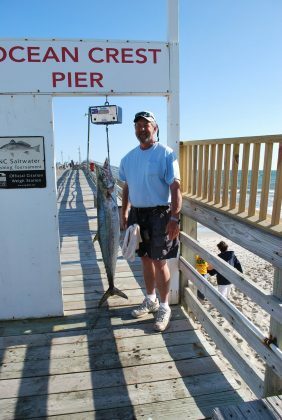 The record for all the Oak Island piers is Bo Crump’s 53 pound, 6 ounce king caught from Ocean Crest Pier on May 7, 1998. The bite was wide open that spring. Crump caught the big king in the morning and after taking a lunch break he returned to the pier that afternoon and filled his 3 king limit. His other kings weighed 41 and 36 pounds. 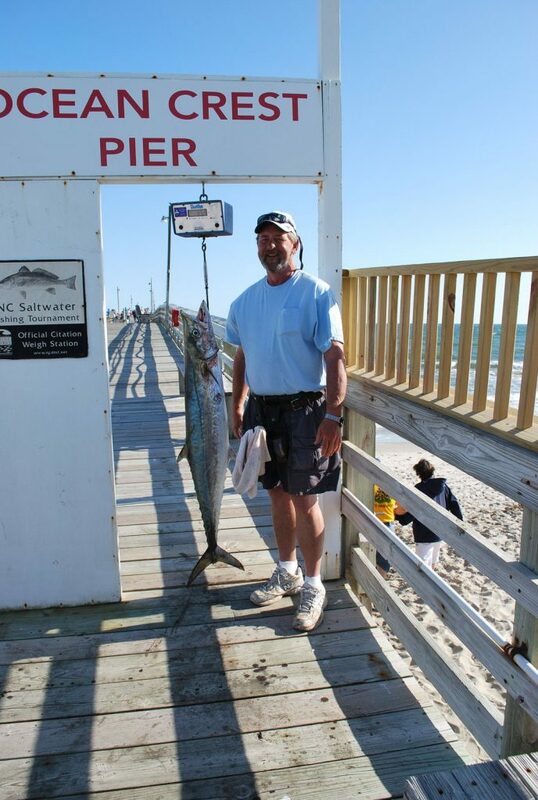 Chuck Huthmacher holds the Oak Island Pier record at 50 pounds even. His was the earliest of the big kings to be decked and he caught it on April 15, 2002. Kathy Davis caught the record for the former Long Beach Pier on April 27, 1991. It weighed 53 pounds and 3 ounces. That record will never be broken with the pier now dismantled and million dollar houses where the pier house and parking lot were once located. 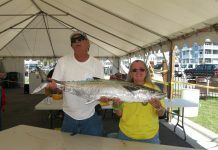 Davis’ king has also held the IGFA Women’s World Record for king mackerel caught on 16 pound class (8KG) line for 27 years now. An interesting side note is that Crump gaffed Davis’ big king. 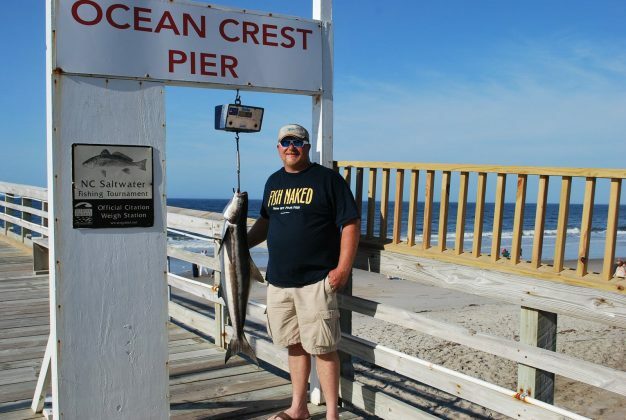 There isn’t any question the pier king bite has begun at the Oak Island piers – or, more appropriately this year, at Ocean Crest Pier. There are also boaters and kayakers getting in on this nearshore action. While not as large as the records, many of these fish are large, healthy kings and lots of fun to catch. If you want to give this action a try, be forewarned that space for a king outfit on the pier end sometime runs out, especially on weekends. The word is out and it is best to arrive early to be sure to get a spot. Boaters heading to Oak Island to chase kings are reminded not to get too close to the piers. Sometimes boaters crowd the pier and it isn’t good sportsmanship or manners. The fishermen on the pier can’t move to fish elsewhere and they can’t maneuver around the props and downrigger cables of a boat that gets too close to the pier. Boat fishermen can’t move fast enough t get out of the way when a king hits and streaks offshore. Boat fishermen should give the piers a minimum of 1,000 feet of clearance. If a visual helps you estimate distance, this is a little more than 3 football fields. Rather than encroach on the piers, boat fishermen can concentrate on fishing the schools of bait moving along the beaches or make a short run to one of the 4 artificial reefs close to the pier. There are also most likely kings feeding in the tide lines around the inlets. The duration of this early king run off Oak Island varies greatly. Some years it is mere days and other years it lasts a month or longer. These fish have already been biting for more than a week. Even without a boat, there is a good probability of getting a king or cobia strike from Ocean Crest Pier. 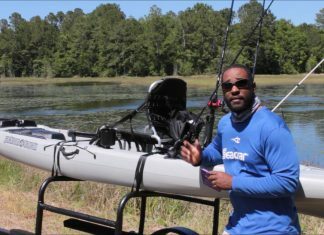 Boat fishermen have unlimited opportunities to hear their reel sing. Once again the first nearshore king bite is off Oak Island and it’s happening now.